When you have an irritating infection like ringworm, your skin is uncomfortable, itchy, and contagious. There are hundreds of different products on the market, but you want the best antifungal cream available. 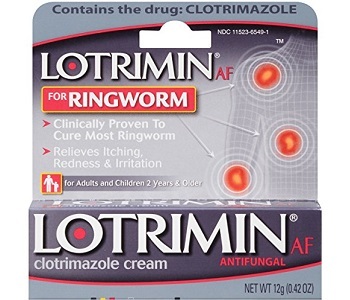 Our review of Lotrimin’s antifungal clotrimazole cream explores how useful this cream is compared to other brands. The active ingredient in this antifungal cream is clotrimazole. It soothes your skin while removing the infection at the same time. Because it is the only active ingredient in the cream, you are safe from unknown ingredients that other creams seem to have. However, other antifungal products put natural soothing elements in their creams to help heal your skin faster. Better creams contain peppermint oil, tea tree oil and aloe allow a quick recovery of irritated skin. We also have found that clotrimazole, although an effective antifungal, easily dries out the skin and could cause more damage to the skin surrounding your infection. 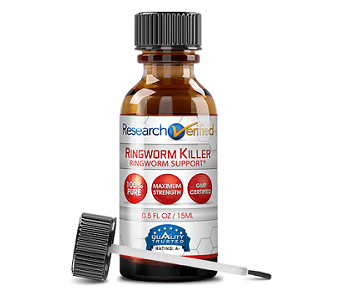 A better treatment for ringworm is undecylenic acid, which works just as well and is much easier on your skin. The recommended dose for this product is twice a day for four weeks. Before you apply the cream, you must wash and dry the affected area. Only use a thin amount of cream and cover the entire affected area. Children must be supervised when using this cream. This product is not suitable for treatment of hair or nails. After reviewing the dosage of other products, we observed that some should be used three or four times daily. Perhaps this could mean a cream with clotrimazole has a stronger effect than other creams with different antifungal ingredients. One 12g tube can be purchased online for $8.79 through Amazon. Through Target it is priced at $10.99, at Walgreens, it is $11.79, and it is $12.99 at CVS. You can print out a coupon that saves you $1.50 on any Lotrimin product. You cannot buy any antifungal creams through the website. After looking through the website, we were unable to find any mention of a money-back guarantee for their products. This is disappointing, because other websites offer a guarantee, even after a year of purchasing. This shows a kind of customer attention that is clearly lacking here. We found mostly positive feedback on the usefulness and efficacy of this product, with only a few negative reports that the cream didn’t work at all. This antifungal cream appears to work effectively with its strong antifungal ingredient, clotrimazole. It is available for purchase online, as well as in most drug stores, and comes with a coupon to save $1.50. However, there are other antifungal creams that contain natural soothing ingredients to speed up your skin’s healing process. We also want to add that there are money-back guarantees from two months to a year available through other brands. Although Lotrimin antifungal clotrimazole cream seems to work effectively for most people, it would benefit unhappy customers to return the cream if it proves to be ineffective.